01 May is anniversary of Narada Rishi and the month is observed as Better Speech and Hearing Month. Narada is the messenger amongst gods and divine beings. He is mentioned in Mahabharata, written by Vyasa in Haridwar. Narada recited Srimad Bhagavatam on the banks of the Ganges, near the sacred place — Haridwar. Great sages like Bhrigu, Vasistha, Gautama, Medhatithi, Markandeya, Dattatreya and Pippalada came to Haridwar to listen to the Srimad Bhagavatam being recited. Sacred rivers were present too, as were mountains like the Himalayas. In 1913, Rabindranath Tagore received the Nobel Prize for literature for his work ‘Gitanjali’ that was partly composed in the Uttarakhand state to which Haridwar belongs. He was the first non-European to receive this prize. Listen to the Introduction to Gitanjali by W.B. Yeats (Duration 14.31 minutes, File size 6.65 mb) below. Listen to the Verses 1 to 10 (Duration 07.10 minutes, File size 3.28 mb) below. The last verse of the book of poems ‘The Gardener’ (1915) by Tagore is given below. spring, one single streak of gold from yonder clouds. Ganga Dussehra also known as Gangavataran, is the day when Ganges descended from heaven to earth, just near Haridwar. This has influenced the culture of India. The first sound picture in India ‘Gangavataran’, was made on this theme, about a decade after Hollywood. (C) Images left to right and top to bottom: Narada by Watchalen Mudkrathok, Narada by Sergey, Tagore’s self-portrait, Ganga and Shabtanu and Gangavataran both by Raja Ravi Varma. 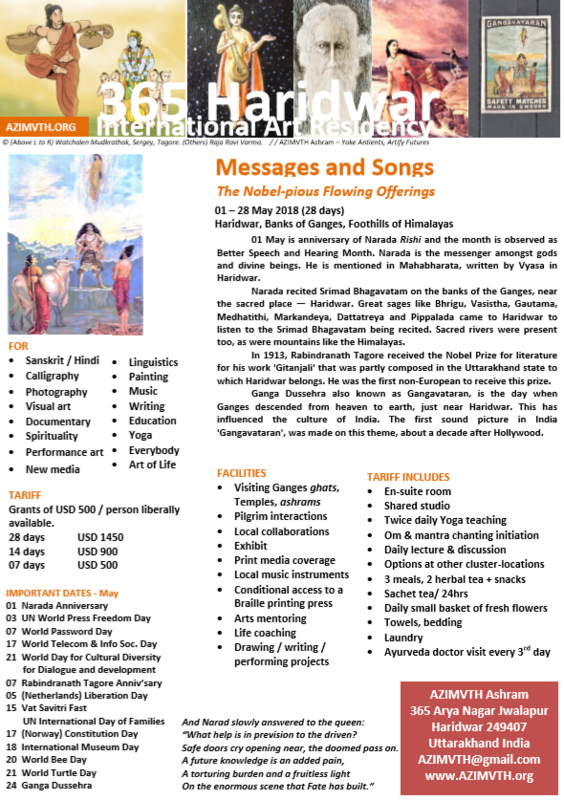 Download a one paged flier as pdf (833 kb) of the residency here and as an image (417 kb) here. Previous postBuddha Jumps Over the River: Kalki in 3378 A.D.